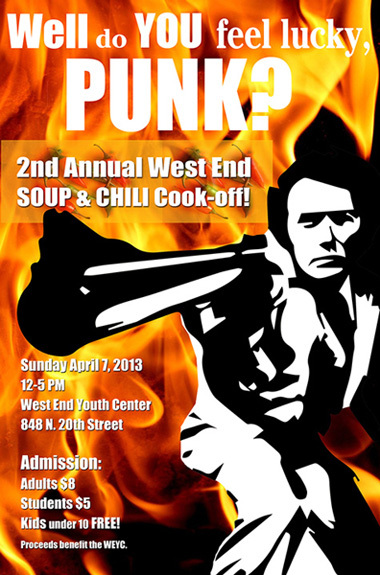 The West End Gastro Club is hosting their 2nd annual soup and chili contest this Sunday, pitting local chefs and restaurants against each other to raise funds for the West End Youth Center. In addition to a straight up chili throw down, the Gastro Club is introducing an additional soup aspect this year. Suffice to say, there will most likely be a gluttonous amount of soup/chili being consumed. We judged this event last year and it was a really solid time, especially for a first-time event. It was a great respite for a rainy spring day. You can check out the full coverage from last year here. The contest, being held at the West End Youth Center, starts at 12pm and goes until 5pm. All attendees will be able to vote for the people’s choice awards and participants will also be judged by a panel of judges. Admission is $8 for adults, $5 for students, and free for children under 10 years old. Come out for what surely will be a good time. Just me or does their website need some serious improvements? Event dates and information on tickets/location/etc woudl be a good start… club seems like a great idea but marketing seems to be lacking. You’re right PS, the website could use a bit of love. This event has been primarily promoted through the “Annual West End Soup and Chili Cook-Off” Facebook page (link below) intentionally in order to emphasize that this is not a WEGC Pop-Up. Admission to this event is paid at the door, and as you can see above, the location and times are printed on large, eye-catching posters hanging on windows of local businesses all over the theatre district, as well as in participating pubs and food establishments.